Anyway, we are off to End of the Road festival on Thursday and it occurred to me that I don’t really have a lightweight jacket to wear. Like, one to throw on over a t-shirt when it gets a bit cooler (which will probably be the entire time). 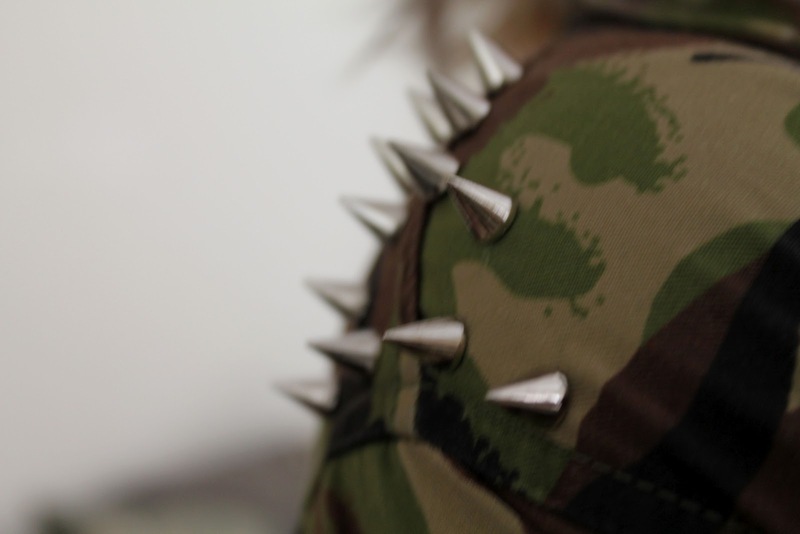 And then it hit me that I needed a camouflage jacket, and probably one with studs in the shoulders. After some searching, I came across this little beauty on ASOS Marketplace. The problem is, with postage it’s £42. And I don’t have £42. So I tweeted about this desperate situation, and Sarah suggested I could probably do it myself much more cheaply. So I decided to have a go, and I thought I’d share it here in case anyone else wanted to have a go! 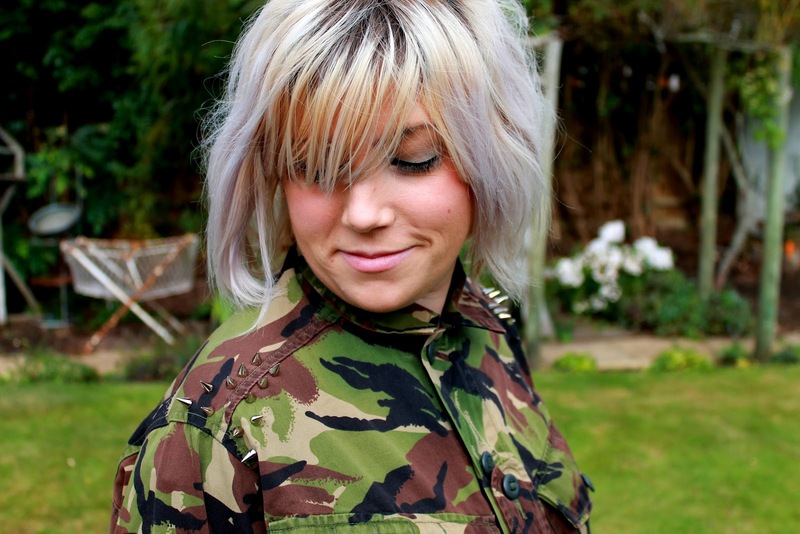 Camouflage jacket or shirt – you can buy these from your local Army surplus store, or eBay has loads. I bought mine here for £9.99. A lot of the army field shirts are thick enough to be considered a lightweight jacket. Studs – I bought mine from eBay here for £5.99. I’d recommend the screw studs as they’re more durable and won’t catch on the clothing you wear underneath. I used small spikes but larger ones would equally look cool. 1. First of all you want to think of the arrangement you want for the studs; do you want a line, a circle, a strip etc? Mark out the arrangement you want with a felt tip pen (when you’ve decided!) and if you’re doing a set on each shoulder obviously make sure it’s symmetrical. If you’re being really exact you may want to use a ruler or measuring tape to make sure they’re all the same distance apart. 2. On the dot you’ve marked, push the needle or pin through to make a hole. 3. Then, get whatever implement you’re using to make the hole bigger and push that through. You need to make sure it’s roughly the same width as the screw of the stud so it doesn’t fall out. Give it a wiggle until you’ve got a clear hole. 4. Then, push the bottom of the screw through the bottom and screw the spike on top. Continue until you’ve finished your arrangement. 5. Put it on and feel awesome that you’ve just saved yourself £26. PS – I’m at my parents’ this weekend and I don’t really have anything that goes with this jacket but I’ll post a full outfit photo ASAP as these photos don’t really do it justice.